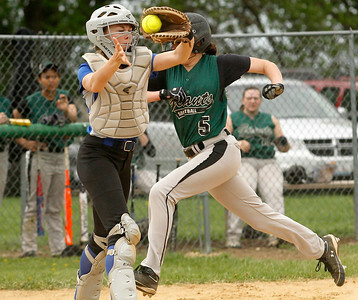 Matthew Apgar - mapgar@shawmedia.com Alden-Hebron's Emily Webber scores ahead of the throw to Woodstock catcher Julia Vosburgh during their softball game on Friday, May 08, 2015 at Alden-Hebron High School in Hebron. 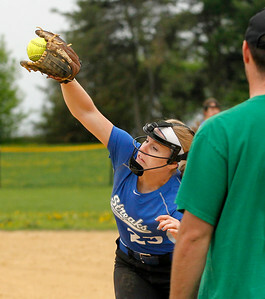 Matthew Apgar - mapgar@shawmedia.com Skye McEstes of Woodstock reaches out to snag a foul ball for the out during their softball game against Alden-Hebron on Friday, May 08, 2015 at Alden-Hebron High School in Hebron. 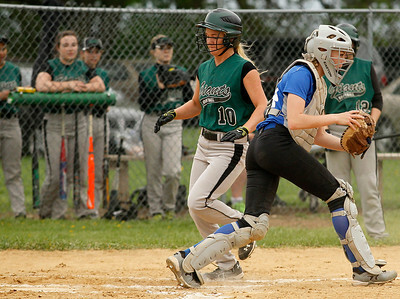 Matthew Apgar - mapgar@shawmedia.com Alden-Hebron's Hannah Behrens, right, avoids a tag from Woodstock third baseman Maddie Ferguson, left, as Behrens completes a bases loaded triple, scoring three runs against Woodstock during their softball game on Friday, May 08, 2015 at Alden-Hebron High School in Hebron. 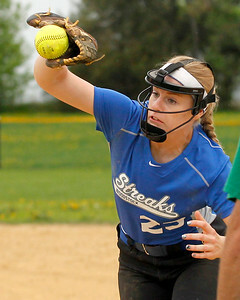 Matthew Apgar - mapgar@shawmedia.com Alden-Hebron pitcher Kassandra Clauss winds up to face a Woodstock batter during their softball game on Friday, May 08, 2015 at Alden-Hebron High School in Hebron. 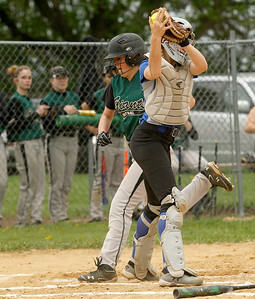 Matthew Apgar - mapgar@shawmedia.com Alden-Hebron's Emily Webber scores, beating the throw to Woodstock catcher Julia Vosburgh during their softball game on Friday, May 08, 2015 at Alden-Hebron High School in Hebron. Matthew Apgar - mapgar@shawmedia.com Alden-Hebron's Hannah Behrens, left, is congratulated at home plate by teammate Chey Knoll after Behrens connected for a bases loaded triple, scoring three runs against Woodstock during their softball game on Friday, May 08, 2015 at Alden-Hebron High School in Hebron. 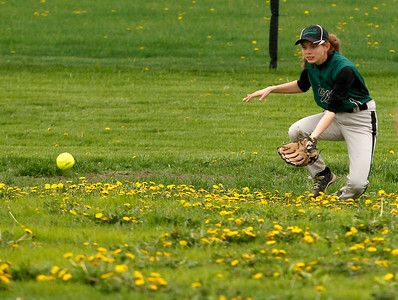 Matthew Apgar - mapgar@shawmedia.com Alden-Hebron's Tiffany Damato gets low to scoop up the ball in right field during their softball game against Woodstock on Friday, May 08, 2015 at Alden-Hebron High School in Hebron. 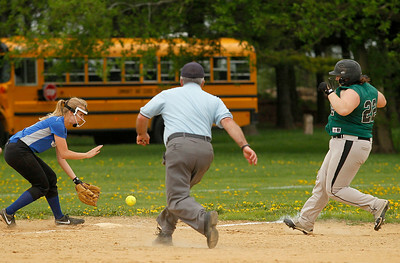 Matthew Apgar - mapgar@shawmedia.com Alden-Hebron's Maddi Brown scores ahead of the throw to Woodstock catcher Julia Vosburgh during their softball game on Friday, May 08, 2015 at Alden-Hebron High School in Hebron. 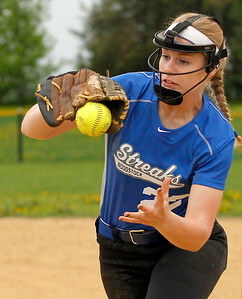 Matthew Apgar - mapgar@shawmedia.com Alden-Hebron's Hannah Behrens connects for a bases loaded triple, scoring three runs against Woodstock during their softball game on Friday, May 08, 2015 at Alden-Hebron High School in Hebron. 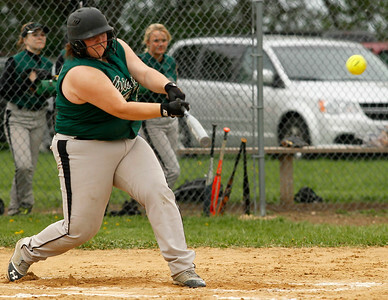 Alden-Hebron's Tiffany Damato gets low to scoop up the ball in right field during their softball game against Woodstock on Friday, May 08, 2015 at Alden-Hebron High School in Hebron.